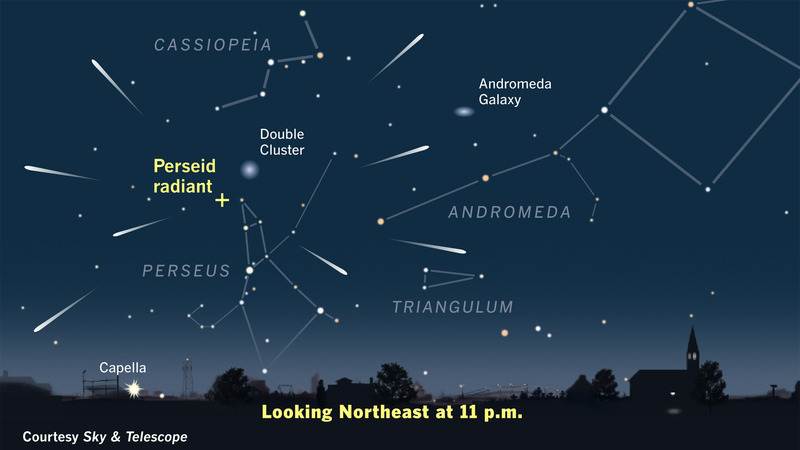 It’s time for the annual Perseid Meteor Shower light show. This show will burst into light as the Earth passes through the tail of Comet Swift-Tuttle. Between July 17th and August 24th you can find front row seats for this astronomical wonder. Picture icy balls of space debris (meteoroids) hurtling through the sky at hundreds of miles per hour. As they reach Earth’s atmosphere they burn up and streak across the night sky; much to the wonder and delight of the humans below. But this year isn’t just any year. In 2016 the Perseids will be in “outburst,” which means that they will appear at twice the rate – that’s right folks, at the peak on August 12 you may see as many as 200 falling stars an hour. It hasn’t been this incredible since 2009! Comet Swift-Tuttle is the largest object known to repeatedly pass by Earth; its nucleus is about 16 miles (26 kilometers) wide. It last passed nearby Earth during its orbit around the sun in 1992, and the next time will be in 2126. But it isn’t out of sight, out of mind, because Earth passes through the dust and debris it leaves behind every year, creating the annual Perseid meteor shower. The key to seeing a good meteor shower is to find a dark, wide open sky with few trees to block the view. Prepare to sit outside for a few hours. Bringing a comfortable lawn or camp chair, a warm blanket and some hot chocolate make it much more fun. It takes thirty to forty-five minutes for your eyes to adjust to the dark; the longer you are outside, the more you’ll see. Don’t turn on flashlights or lanterns with white light, it will diminish your night vision. If you need light, cover your lens with red cellophane. Then sit back, relax and wait… A rate of 150 meteors per hour, for instance, means two to three meteors per minute, including faint streaks along with bright, fireball-generating ones that are truly ooh & ahh-inspiring.